Block-modular underground plants are intended for deep biological treatment of household and domestic sewage from 8 to 25 m³/day. We recommend the use of such plants with a low groundwater level and the presence of prefabricated reinforced concrete elements. On a joint reinforced concrete plate there are installed six reinforced concrete wells. In two wells are placed polypropylene bioreactors SBR2 and SBR3. In the well of the receiving chamber, aeration systems and sewage water pumps are installed. 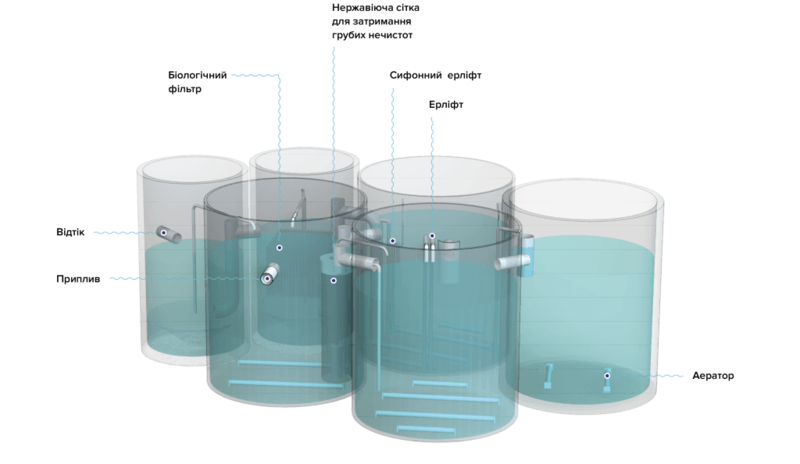 Sludge tank is provided for the accumulation of surplus activated sludge. Biofilter loads and circulation airlifts are mounted in the biofilter well. Decontamination of treated sewage is provided in the contact tank.